Man-of-the-moment Jack Holder produced another masterful maximum as Peterborough Panthers triumphed on a testing June 23 night at the East of England Arena. The Australian ace roared through the card to record a 15-point full house for the second successive Friday as bottom side Berwick were seen off 53-39 in an SGB Championship clash. Holder’s terrific display included a tactical-ride thwarting success in heat 11 and a meeting-clinching victory when teaming up with guest number one Rory Schlein for a 5-1 in the 13th contest. 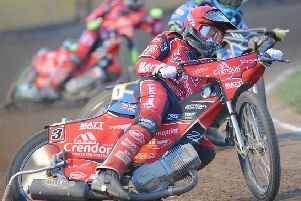 He has now racked up a staggering 56+1 points during four Panthers appearances in the space of a week and team boss Carl Johnson admitted: “I’m fast running out of superlatives to describe Jack’s performances. “He is almost untouchable at the moment. He is incredibly fast and he is beating some good riders by a long way. Frightening crashes involving Berwick number one Nick Morris are also becoming a frequent occurrence at Alwalton. He was extremely fortunate to walk away from a high-speed spill with Holder in the final heat of the Bandits’ previous visit to this part of the world on June 11. But there was no lucky escape from an awful-looking smash in heat one last night as he lost control going through the first bend. Morris face-planted violently into the track as he bike flipped and was briefly knocked unconscious by the impact before being taken to hospital. The finger of blame for that crash was pointed at the heavy East of England Arena surface with riders from both teams demanding that extensive track-work be carried out while Morris was handed over to the care of ambulance paramedics. A delay of around an hour ensued with the meeting then being completed at a frantic pace ahead of a 10pm curfew – a deadline which was beaten by seconds rather than minutes! Panthers’ performance certainly proved to be worth the wait for a sadly sparse crowd (a busy spell of home fixtures no doubt a factor in that) with Holder receiving fine support from fellow Aussie ace Schlein. The guest number one completed a hat-trick of heat wins before following in Holder for that 5-1 in heat 13 which sealed victory. He only saw his own hopes of a maximum disappear in the finale when having to settle for third place. Captain Ulrich Ostergaard and Paul Starke both contributed impressively in the middle-order while reserve Tom Bacon earned one of the biggest cheers of the night with a third race win of the season. Bacon rode expertly to claim a start-to-finish success in heat eight when partner Bradley Wilson-Dean tumbled out for the second time in three races. The New Zealand champion also came to grief on the final lap of heat six when the damage was also minimised by a success for his team-mate. Schlein triumphed on that occasion with the race awarded just before he could take the chequered flag. Wilson-Dean, who also raced off a 15-metre handicap in the first heat after going into the tapes at the start, had to settle for two points - a tally matched by reserve Richard Hall, whose sole scoring contribution came when second in heat two. He later suffered last places either side of an exclusion for losing control and causing Berwick man Joe Jacobs to hit the deck in heat 11. “It was a meeting we had to win – and we did it,” added Johnson. “I must thank the supporters’ for their patience during a long delay and they were treated to some absolutely fantastic racing in the end. Panthers are back on home shale tomorrow (June 25) when they entertain title-chasing Glasgow (5pm). PETERBOROUGH: Jack Holder 15 (max), Rory Schlein (guest) 12+1, Ulrich Ostergaard 9+1, Paul Starke 8+2, Tom Bacon 5+1, Bradley Wilson-Dean 2, Richard Hall 2. BERWICK: David Howe 11+1, Kevin Doolan 11+1, Jye Etheridge 8+1, Joe Jacobs 5+1, Dany Gappmaier 3+1, Alfie Bowtell (guest) 1+1, Nick Morris 0 (withdrawn). 1 - re-run x3 Schlein (59.3), Jacobs, Wilson-Dean (15m), Morris (fell/exc). 4-2, 4-2. 2 - Etheridge (60.8), Hall, Bacon, Bowtell. 3-3, 7-5. 3 - Ostergaard (60.3), Starke, Howe, Gappmaier. 5-1, 12-6. 4 - Holder (60.8), Doolan, Bacon, Bowtell. 4-2, 16-8. 5 - Howe (60.6), Ostergaard, Starke, Jacobs. 3-3, 19-11. 6 - Schlein (awarded), Etheridge, Doolan, Wilson-Dean (fell/exc). 3-3, 22-14. 7 - Holder (60.8), Howe, Gappmaier, Hall. 3-3, 25-17. 8 - Bacon (61.8), Jacobs, Bowtell, Wilson-Dean (fell). 3-3, 28-20. 9 - Doolan (61.5), Starke, Ostergaard, Etheridge (ret). 3-3, 31-23. 10 - Schlein (61.8), Howe, Wilson-Dean, Gappmaier. 4-2, 35-25. 11 - re-run Holder (61.9), Doolan (t/r), Jacobs, Hall (exc). 3-5, 38-30. 12 - re-run Starke (62.2), Gappmaier, Etheridge, Bacon. 3-3, 41-33. 13 - Holder (61.9), Schlein, Doolan, Gappmaier. 5-1, 46-34. 14 - Ostergaard (62.6), Etheridge, Howe, Hall. 3-3, 49-37. 15 - Holder (62.5), Howe, Schlein, Doolan. 4-2, 53-39.